Beginning with a long and extensively rewritten introduction surveying the predecessors of the Presocratics, this book traces the intellectual revolution initiated by Thales in the sixth century BC to its culmination in the metaphysics of Parmenides and the complex physical theories of Anaxagoras and the Atomists in the fifth century it is based on a selection of some six hundred texts, in Greek and a close English translation which in this edition is given more prominence. These provide the basis for a detailed critical study of the principal individual thinkers of the time. 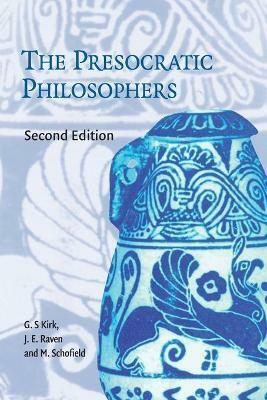 Besides serving as an essential text for undergraduate and graduate courses in Greek philosophy and in the history of science, this book will appeal to a wide range of readers with interests in philosophy, theology, the history of ideas and of the ancient world, and indeed to anyone who wants an authoritative account of the Presocratics. Beginning with a long and extensively rewritten introduction surveying the predecessors of the Presocratics, the book traces the intellectual revolution initiated by Thales in the early sixth century B.C. to its culmination in the metaphysics of Parmenides and the complex physical theories of Anaxagoras and the Atomists in the fifth century. It is based on a selection of some six hundred texts, in Greek and a close English translation which in this edition is given more prominence. These provide the basis for a detailed critical study of the principal individual thinkers of the time. Preface to the second edition; Preface to the first edition; Abbreviations; Introductory note; 1. The forerunners of philosophical cosmogony; 2. The Ionian thinkers; 3. Philosophy in the west; 4. The Ionian response; Selective bibliography; Index of passages; General index.